Are you a man’s man? Do you love sports? Do most of your outfits sport a 1970s-western vibe? Are you a bit clueless when it comes to political correctness? Then you might be Champ Kind, Channel 4’s best sports newscaster! Honestly, let’s face it… Ron Burgundy is your best friend, and he’s definitely a cool guy, but you know you’re the real reason that the TV station keeps its viewers coming back every night. Who could resist you? Part of your charm, of course, is your impeccable taste in fashion. You wouldn’t be caught dead without your cowboy hat, and you’ve got a stylish tie for every blazer. We don’t even have to mention your always fantastic hair! If you want to emulate Champ’s enviable style, you’d be wise to invest in this Anchorman Champ Kit. 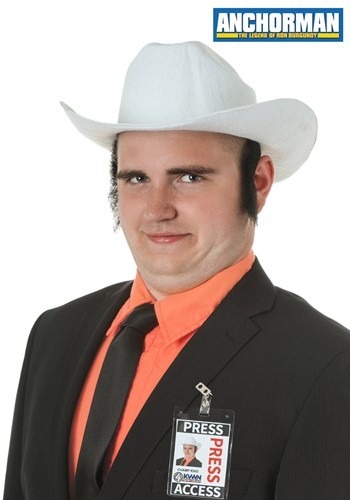 It includes a white cowboy hat, a black polyester tie, black sticker sideburns and an official-looking press badge in a plastic holder that clips onto your shirt pocket. Now you’re ready to host your own sports newscast. Whammy!